Tiger Woods won his 15th major championship and fifth Masters in a very un-Tiger like manner, though some factors in his victory did fall right in line with his major-winning history. 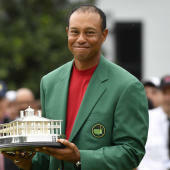 After his first-round 70 on Thursday, Woods mentioned that he shot at least 70 in the first round of each of his previous four Masters victories. He also was 11 under after 54 holes, and each of the prior times that he had that mark or better after 54 holes at Augusta National, he went on to win a green jacket. But this was the first time at the Masters that Tiger has won without holding the 54-hole lead. In fact, he did not take a share of the lead until the 66th hole and only then held it for a moment. Woods took the lead for good at No. 15 and finished under par in four straight rounds. Tiger's style of winning major championships often goes like this: (a) shoot something close to or just under even par on Thursday, (b) go low on Friday and/or Saturday, (c) play defense with the lead on Sunday. In a way, his scores -- 70, 68, 67, 70 -- do follow a similar pattern, but this win needed an aggressiveness that does not at all line up with a defensive style of play. Some of that was his own doing as Woods needed low scores to make up for back-to-back bogeys on Nos. 4 and 5. But the tournament also played into his hands a little bit as well with Francesco Molinari and the others at the top of the leaderboard making crucial errors down the stretch that cost them chances to win. Woods showed a balanced approach of knowing when to hit the gas and when to make the safe play, going bogey-free from No. 11 to No. 17 in a seven-hole stretch that clinched the victory. This win by Tiger was unique onto itself, as was the history Woods created in coming back after such a long drought to win a fifth Masters and 15th major, putting back in play what once seemed to be impossible -- Jack Nicklaus' records. Let's take a deeper look at Tiger's round and how he survived a battle royale on the leaderboard to emerge as the 2019 Masters champion. The first hour or so of Tiger's round was the most unique Sunday atmosphere we've ever seen at Augusta National. Threesomes teed off No. 1 and No. 10, so the largest-ever weekend field in Masters history (65) was all packed onto the course at the same time when the Tiger, Molinari and Tony Finau got started. The wind started to pick up, the clouds were ominous, and it created a tension that might as well have been "Sunday afternoon tight," even with the mid-morning hour. Not to say any of that impacted Tiger or led to his bogeys on No. 4 and No. 5, but the mistakes and the missed opportunities on those holes -- particularly the par-3 4th, a hole he birdied on Friday and had otherwise gotten par on this week -- added to the palpable uncertainty surrounding the conclusion of this tournament. The heavyweight fight between these two major champions really started at the par-5 8th. Both players were in attack mode looking for the eagle opportunity but ended up with birdie looks that were far from gimmes. First, Molinari rolled in his birdie to push the lead to 13-under, and then Tiger let the world know he would not be left in the dust, burying his birdie putt as well. Coming off the bogey at 10, Tiger pulled his drive into the woods on 11. Given the stakes and the status of the leaderboard, this looked to be a moment that could cost him the tournament. Woods delivered with an absurd recovery shot, saving par on the hole. After Molinari found the water on 12, Woods stepped to the tee next with full understanding of the tournament. There was going to be an adjustment at the top, but this wasn't the time to go for a two-shot swing. Woods took aim at the center of the green, delivered a high ball right on the number and cleaned up a two-putt par before heading to the par-5 13th, where he had already recorded birdies in two of his previous three rounds and would go on to card his third birdie of the week. There have been fantastic moments for Tiger Woods at the 16th hole, but when he damn near aced it on Sunday, I think we got a new highlight that will live forever in Masters lore. While Woods had gotten a very on-schedule birdie on the previous hole, Molinari carded a double-bogey. Elsewhere on the course, Patrick Cantaly's brief run at the lead had fallen apart and Brooks Koepka was knocking on the door but unable to get enough birdie putts to drop. Tiger grabbed control of the tournament on 15, but he won it on 16. Woods missed a par putt but managed bogey -- the minimum he needed to win clear of the field -- in a moment that will live on in history both at Augusta National and in the world of golf.